Paul Krugman explains how to break the climate policy deadlock | Watts Up With That? Paul Krugman — Nobel Laureate economist, #5 on Prospect magazine’s 2015 list of the world’s top “thinkers” — gives us powerful advice about the climate policy debate in his August 12 NYT op-ed (similar to this from a February column). It is the standard doctrine for science, except in climate science. “Here’s how I would approach the issue: by asking how we know that a modeling approach is truly useful. The answer, I’d suggest, is that we look for surprising successful predictions. General relativity got its big boost when light did, in fact, bend as predicted. The theory of a natural rate of unemployment got a big boost when the Phillips curve turned into clockwise spirals, as predicted, during the stagflation of the 1970s. Paul Kurgan talks about economics. Climate scientists can learn from his insights. Milton Friedman’s advice about climate models & how to win the policy debate. Scientists could re-run older models with actual emissions, not projections, and comparing their forecasts with observed temperatures. These multi-decade predictions would provide objective, powerful data that might resolve the policy debate — or at least create a clear majority of public opinion for one side so we can move on. Articles like the one described here by Paul Krugman show that even the most alarmists of the alarmists know — at some level — that the the methodological basis is weak for massive public policy action on climate change. Taking this one step more, guessing — this cognitive dissonance (clashing truths in their minds) might account for some of the hysteria with which they reply to questions — no matter how simple and well-founded. If they were confident in their facts and logic they would welcome questions (call “buy signals” in sales). This comment is profoundly true. The growing shrillness and unwillingness to engage is because they know their case weakens more every year, as all the past alarmist ‘projections that have NOT come to pass make them look increasingly bad. NYC west side parkway is not under water (Hansen) . Extreme weather has NOT increased (Hayhoe). Polar bears thriving (Gore, Sterling). Arctic ice has not disappeared (Wadhams). No climate refugees from Tuvalu. Skeptical scientists like Lindzen, Christy, Curry increasingly heard and increasingly ‘right’. The “skeptic side” is not advocating anyone or anything be crushed as far as I can tell . . rather merely that a particular theory not be treated as Gospel, so to speak. You’re metaphorically casting this as a fistfight, one might say, but I see it as a mugging with the muggee merely trying to avoid being robbed. This approach of yours is playing into the hands of the mugger, I feel . . Like you’re shouting; Hold on, don’t keep trying to get away . . , the disagreement about who should have what’s in your wallet can be resolved I believe, if the mugger is given another chance to make his case . .
See, one “side” is demanding all sorts of very expensive things be done, and the other is making no such demands . . It’s not a contest of demands . . The alarmist side is great at projecting their own transgressions onto the skeptical side. No need to travel far to find evidence supporting my assertion. Lots and lots of comments at WUWT about how President Trump will smite the alarmists. Also, calling me an alarmist is quite delusional. You mean Trump might cut off their government research funding and cut off the subsidies to green business? Sounds like just leveling the playing field. John Knight, I have to agree. It seems to me that this article sets up a false narrative. Skeptics mutter about vast conspiracies of climate scientists. Lost in this futile decades-long debate is discussion about the methodological testing necessary to create confidence that the results of climate models provide an adequate basis for public policy decisions that shape the world economy. The author of this article must be reading too many “Lew papers” that try to sell CAGW on the basis of the 97% consensus (false) and skeptic conspiracy ideation (false). This article is a fail because it positions skeptics as a group of monolithic conspiracy theorists when I believe this is not even close to being accurate. I’m a scientist and engineer. I’ve helped build some of the space systems from which data used in this endeavor originates. It’s painfully obvious that the methodology in climate science is flawed (primarily modeling with no validation against real world). We skeptics are railing against the inertia of the majority that fail to be open minded about the theory being wrong after an increasing number of spectacularly failed predictions (e.g. Equatorial tropospheric hot spot anyone? Increasing extreme weather anyone? etc.). I am open to the fact that we’re causing some of the warming. But, I’m still waiting for one single empirical, data-based observation that supports the theory. So far, no luck for the warmists. As for Krugman, I can’t believe that I actually agree with one of his thoughts for the first time. He is proof that Nobel is not the prestigious award it used to be. As a hard-core Keynesian, he loses all credibility with me. Try the book “Where Keynes Went Wrong” by Hunter Lewis if you think John Maynard Keynes was right. Then to educate yourself further, try either “Economics in One Lesson” by Henry Hazlitt, or “The Road to Serfdom” by Nobel Laureate Friedrich Hayek, or “Free to Choose” by Nobel Laureate Milton Friedman, or “Capitalism and Freedom” also by Friedman, or all of the above. Adam Smith had it right. Keynes had it wrong. Krugman is a Keynesian. ’nuff said. Funds to the “skeptic side” have been cut off all along . . And here is Larry asking that we go along with the alarmists be funded for a decade or whatever longer, to give them yet more attempts at producing something that might help convince Congress to go along with their associated demands . . at our continued expense (in part) . .
Are you kidding? Broad statements about groups do not, in non-academic discussion, imply that they apply to each and every member of the group. I’m sure you know this, which makes your comment …odd. As to belief in conspiracy theories about climate scientists distorting the data — no need to go far to find evidence. Read the comments in this thread. There are many making that exact point. Odd that you don’t see this. I’m not slave, Larry, and I have no moral obligation to remain silent when I believe I am seeing agenda driven science related tomfoolery. Besides which, the very thing that got my (serious) attention regarding global warming science, was the savage treatment of those then referred to as “Climate deniers”, and declarations of “settled science” that I saw as preposterous. This was an assault me (us) and even science itself, as I see it, and I will not pretend things like “climate-gate” and the Rico shakedown are indications of a scholarly debate. Where is all the government funding to research None global warming? Does the IPCC put out a skeptics argument section? Does anybody that is getting funding say anything that doesn’t further the narrative? The funding is to create a narrative, the narrative is to create a climate, the climate is to create political pressure, the political pressure is used to gain control. To not see this is to ignore the truth and to except the recurrence of failed history to the detriment of all free people. You are trying to defend your weakest point; using the double down defense, hoping that we will back off if you repeat erroneous opinions often enough. I get the distinct impression you don’t actually read all comments. Maybe a quick glance, generalized understanding, perhaps. Here you are perpetuating the myth that sceptics want to ‘crush’ anybody, but a few blatant liars. That certainly does not include gullible people who fall for the CAGW scam. • Sceptics send death threats to alarmists. Instead it’s uncovered that one guy answering questions at a dinner table about his Kangaroo hunting license was changed into ‘death threats’. Many other claims about alarmists receiving death threats have been busted when they were asked for evidence. Meanwhile, ask any of the sceptic/lukewarmer bloggers about the death threats they receive…. • Sceptics will not debate. • Sceptics are all conspiracists. There are quite a few published notes/emails that have identified real conspiracies. Unlike all of the alarmist claims about ‘fossil fuel’ bought, Koch supported, well funded doubters. About all of those ‘comments’ that expect Trump to ‘smite’ the alarmists. Now, you are really stretching truth. Virtually every comment with few exceptions anticipate Trump to cut off CAGW funding, fire the activists playing fast and loose with the science and to take measures to bring real science back. As for as the majority of CAGW believers; they’re religious drones. When their leaders are fired for incompetence, fraud or just plain brainless, the drones will find a new belief to worship. Most of us feel honest pity, and yes disgust at the more obnoxious, for the activists/advocates who honestly believe in consensus and ad hominems drive science. Nor do we expect these drones and activists to suffer. I seriously doubt that most of them will claim serious belief for CAGW CO2 disasters in their dotage. Krugman is a waste of time to read. Whatever his topical brilliance in a sector of economics, that fails to give him omnipotence or even superior intelligence. Instead of reviewing CAGW economic claims or predictions rigorously, he just accepts whatever speculated CAGW claims are used to inflate problems. Ideally Krugman should have dissected those economic models, and then reconstructed their analysis starting with present day observations. Logical reviews of each CAGW variable should be based on actual observations. Once anyone starts playing “what if” models, reality is lost. Perhaps you should actually read and digest skeptical/lukewarmer comments; here, Bishop Hill, JoNova, Dr. Curry, Climate Audit, The Big Picture (formerly No FrakkingConsensus). Pay attention to the previous name At Donna’s website; Maybe even read some of her books! You seem to read selectively (which seems to be a consistent theme in your responses here). I’ll try again. Point 1: Your narrative is false in my opinion. You set up a straw man to shoot down using a generalization that I believe to be untrue regarding a majority of skeptics. We can disagree on the percentage of skeptics with the conspiracy ideation you and Lewandowski seem to be pushing but the fact remains that without evidence you use a false generalization (my opinion) as part of the foundation of your article. Point 2: You talk about the idea of methodological testing of models and theory against reality being lost on BOTH “alarmists” and “skeptics”. Bull. That is precisely what this website excels at–allowing a voice to those who are showing that the theory doesn’t match the data (e.g. Mr Eschenbach, Mr Steele, etc.). And there are plenty of notable skeptic blogs/websites that do the same thing you say is lost on skeptics (Bishop Hill, Climate Audit, Jo Nova, Dr Roy Spencer, GWPF, etc.). The idea of what is required for falsification of a scientific theory is not lost on most skeptics. That’s why most of us are skeptics! Odd that you don’t see this. ~ I can vouch for Boulder Skeptics point #1 . . There are many climate alarm skeptics who studiously avoid any hint of any suspicion that intentional fraud/manipulation has been perpetrated by anyone in the alarmist crowd, and even I (who believes “conspiracy” in the hard-core sense has gone on from the get-go, and continues apace) generally couch my criticisms in terms that minimize that potential aspect of what has been going on with the CAGW phenomenon. But I am getting tired of it . . for humans are capable of dishonesty and greed and cruelty and so on, and there is no reason to think anyone’s tongue would cleave to the roof of their mouth if they dared speak a conspiratorial word to like-minded interested parties. It’s easily demonstrated that people, including some with degrees in scientific subjects, have “conspired” in various ways in reality-land. It cannot therefor logically be taken off the table, so to speak, entirely. If your argument depends on there being no chance whatsoever of any conscious collusion (conspiracy) going on among any on the very long CAGW gravy-train, so as to render anyone who expressed any sense that we’re being conned; out of order/discredited by default, as appears to me to be true in this thread at least, Larry, you have no argument as far as I’m concerned. Graphic, perhaps you should look at the temperature anomalies that were published in past years that were changed. NOAA/NASA within the last year has once again changed the temperature anomolies… not some years, all years. How many times do they need to adjust the temperatures ? Do you really think NOAA/NASA has any kind of credibility? You need to be more clear on what you think a Conspiracy is. Most definitions I’ve seen include secrecy. There also is research showing the maximum size a Conspiracy could be for it to have survived for a specific period of time. For example, the moon landing conspiracy theory could have included no more than 251 NASA scientists for it to have not unraveled during the 50 years since (http://www.bbc.com/news/science-environment-35411684). Under these guidelines, ClimateGate qualifies as a Conspiracy which was exposed. However, the IPCC, EPA, GISS, Democrats, et al activities, since they are not concealed and involve perhaps millions of people, cannot be called (even in jest) a Conspiracy – an evil movement maybe, but no Conspiracy. From what I’ve seen here at WUWT and other skeptic sites, I expect that no more than a handful even would entertain the term Conspiracy. For Alarmists even to try tarring skeptics with the word Conspiracy helps demonstrate how their tactics are closer to PR/Propaganda than true science. A conspiracy requires two people. Do you understand that such a “study” itself could have been paid for by people wishing to muddy the water, so to speak, and perpetuate the notion that conspiracy is extremely rare/virtually nonexistent? What do you think goes on within an “evil movement”, if not things like conspiring in various ways? Why call it evil if that sort of thing is not going on within it? Not, let me show you how this works and why you should believe it. I have been searching for that for 2 decades now. I took a class at Stanford on global warming. They never even tried to prove the 1.5 or 2C. They never even tried to prove 3 feet of water rise or whatever. They stuck to the most basic things you can imagine. They talked about feedbacks in theory. They never showed any of these actually are real. They never showed with data anything. They didn’t go to the climate record because it is embarrassing. Too many confusing points to explain. I have talked to liberal after liberal who claims to believe this stuff but no matter how smart they are or what science they are in they never have any knowledge of the subject. They simply believe what the climate scientists tell them. There is a profound lack of interest in the science by the liberals especially the ones who claim to be most concerned and militant. They rail and rail but only use call to authority. This is NOT the way I ever learned or did science. Let’s get beyond the fluff. There are 4 classes of GW believers. 1) The nodding smart liberal who is probably science trained, who has not looked into the science but has a belief the scientists are right but is unsure a bit but unwilling to doubt it but unwilling to really speak forcefully for it and is probably a little scared to look into it too deeply because they have seen issues that disturb them but won’t admit it. These people will listen to arguments and nod their head offer no rebuttal and just be bored by the whole topic. 2) The activist who has no actual science training at all and simply uses the science as a cudgel to batter for causes they believe in. They use expletives and never appeal to anything other than authority. They are hateful and a pain to talk to because they only have spit and bile and moronic arguments. 3) The climate scientist type who is doing work in the field and believes in co2 doing negative things and believes that the politics of preventing climate change no matter how small or large is more important than the truth. Willing to modify the data, methods, misreport information, possibly with a subconscious desire to keep their career alive by keeping the fear alive and the grant money coming and a subconscious hatred for man and fear that man is doing evil in the world that needs to be stopped or the world will end. 4) The follower. These are not science educated who simply accept what they are told by the authority figures and will speak that they are sure because authority tells them and will vote as they are told but don’t think about it. They will laugh off any arguments against. They will cut short any discussion or descriptions for fear of upsetting the careful script in their heads about the subject. As you can see there is very little room to actually engage any of these people and have an intelligent discussion. The few I have spoken to in category one may admit the effects of GW are overplayed but just as they are unwilling to do anything to help climate science they are unwilling to do anything against it. “Massive”? Do you mean of some large magnitude? Just as the dictionary says: massive, meaning exceptionally large. I assume you are kidding, pretending that sentence was not clear. The root of massive is mass, signifying properties related to weight and inertia. Massive as an sensational, overwrought modifier for anything large whatsoever is just a popular youngster’s corruption of the original word. It indicates a lack of imagination, the boundless contemporary dictionary and all of its urban lingo notwithstanding. Speaking of astronomy, “massive” void, emptiness, or gas is another silly convention. In 60’s while @ PSU, worked with ANALOG computers. Main directive: if your observations disagree with the predictions from your model – CHANGE THE MODEL! Unfortunately today, NASA and others are changing historical (started with Hansen in 2000) to make “histoical” data more closely match their projections! Climate Scientists all around the world should have crucified Hansen in 2000 when his new temperature graph differed from the 1999 version because he changed data from 30’s, 50’s & 70’s! Historical data is sacrosanct unless you can prove method or equipment was biased. Hansen didn’t even need to try and he’s still revered! That shows the depravity of AGW promoters today! He is not a Nobel laureate! There is no Nobel prize in economics! There is only a prize for economics in the memory of Alfred Nobel, issued by some bankers. Maybe it would be good for the world if the author applied his suggestion to the dismal art of economics. Perhaps we wouldn’t have all of this ‘massive’ 🙂 debt crushing the future under its elitist beneficiaries’ heels. Unfortunately people peek. And if they don’t like what they see they close the door. That is why those who developed the models will never publish such a study. Indeed the fact that such a study has not been published is a good indication of the likely results. Paul Krugman is a true dyed in the wool warmist / socialist, exactly what I would expect. Actually, considering that “climate” is usually defined as a 30 year average of the weather, 60 to 90 years would be appropriate. Not really, because modeling doesn’t have to be relegated to a single year; rather, it could be used to model any sequence of decades, or even centuries–and these forward or backward. Because their models can’t hindcast or forecast, their failure is sufficient to call them out for being dishonest at most and devious at least. When I took engineering at university we weren’t told to use 30 year averages. We were told to look for extremes and do recursion analysis. Many of our projects would last 60 to 100 years. Why did we define 200 year flood plains? Politicians ignore them anyway. They place their bets on “average” climate. Except when it is convenient to use extremes. I worked on upgrading projects for facilities that were closing in on 100 years old or “three climates” old. They still worked well. We adapt, and we upgrade our facilities. 30 years is a blink in time. I have always had a problem with a definition that defines “Climate” as a 30 year average. That wouldn’t even make sense to the Anasazi who may have moved on due to real climate change 1000 years ago. I think there is a missing ‘zero’ from the “average climate definition”. First they would need to model something right…..
Krugman has been wrong about everything. The IPCC has been wrong about everything. Seems like a good match to me. Again, we have another wearisome call to restart the “climate change” debate on more friendly terms. The “debate” is a false issue. CAGW was created out of whole cloth and still does not have the first line of empirical proof to support it. There is nothing to debate from a scientific standpoint. TonyL, I would be slightly more moderate in order to be much more persuasive. CO2 is a greenhouse gas, established by Tyndall for the Royal Society in London in 1858. That is a first line of empirical proof. But, its dry grey Earth impact is 1.1-1.2C per log doubling. So whether that matters depends on feebacks like water vapor and clouds. There, we haven’t empirical proofs. But we do have Monckton’s recent posts here on how those theoretically work, with a resulting sensitivity perhaps 1.6. And we have in the past 3 years a number of completely separate excellent observational energy budget papers saying 1.5-1.8 depending on stuff like aerosols, but based mostly on IPCC inputs. That range says we can all fo home and relax. RCP8.5 is physically and logically impossible. The climate models run hot (tropical troposphere hot spot, divergence to observed troposphere temperatures). And unless you put impossible RCP8.5 through hot running models, there is no CAGW. That still ignores natural variation. Bottom line, CAGW becomes aGw. Alarm cancelled. Thanks, your call for moderation is noted, and heeded as is possible. As you note, CAGW is a creature of the models. A lot of the rest is theory, like Monckton’s posts and ECS. I have been trying to keep up with the evolution of the 1.1-1.2C per log doubling. An interesting story in it’s own right. On the other hand, Willis E. had a recent post where he shows water vapor feedback starts positive at ~4 W/m2, shifts negative and zooms to -200 W/m2. If this line of investigation works out, then the whole thing was about nothing. Yes, CO2 is a greenhouse gas. But I remain humble in the presence of nature. Consider water, that most common of substances. We measure it’s boiling point, freezing point, enthalpy, entropy, create phase diagrams, on and on. Yet nowhere in our lab work on water are we ever given a hint of the ability of water to form hurricanes. Scale matters and things work differently in the atmosphere at large. TonyL, some references. Curry’s Climate Etc had a very early 2010 post on pure SB, calculating 1.0C per CO2 doubling. AR4 had effectively 1.1 for ‘grey earth’. Lindzen 2011 and Parliamentary 2012 testimony used 1.2. Monckton’s recent post figured 1.16. Good enough for government work. If sensitivity is over 1 degree per “doubling”, meaning 280 to 560 ppm, why would the ice core variation from 180 to nearly 300 show a negative sensitivity? I’m defining negative sensitivity as CO2 dependence on temperature rather than temperature dependence on CO2. We all know that there is an approximately negative logarithmic relation between increasing concentration and sensitivity… that higher concentrations result in less sensitivity. The sensitivity should have been higher between 180 and 300, but it wasn’t. It was inverse. the strategy is to wear you out. persuasive? Anybody can think whatever he wants. there is no debate and there are no friendly terms. leave my wallet alone. that is all. there is no part of ‘MINE’ that’s hard to understand. there is no part of ‘NO’ that’s hard to understand. Alarmists don’t make any predictions these days. They make projections, so Krugman’s criterion “look how well their predictions match the real world” does not apply. Clever guys. Models used in the past ARs can be tested by running them with actual emissions from after they were created (preventing tuning them), and comparing the resulting *forecast* (technically a hindcast, as it is from the model’s future but our past) with actual global atmospheric temperatures. If you think those models get everything else just right, make your arguments, it’s free country (for now). This is a completely disingenuous comment. The “spaghetti graphs” have very little to do with varying projections of emissions. They are all over the map because they refuse to contemplate any negative feedbacks or search for proper data with which to work. For the cost of a fraction of what has been spent on climate research by governments, we could have put sufficient satellites into orbit to accurately measure the amount of energy leaving earth across the spectrum. Instead, NASA spends it’s budget on Muslim outreach while NOAA advocates the use of ship engine intake water measurements as scientifically valid. The so-called climate scientists conspire to pervert peer review and climb onto the Socialist government gravy train. Is there really any doubt that there really is, at least effectively, a conspiracy? Which are now being implimented will take years to get rid of,there is too much money at stake and the public knows less than nothing having been misinformed for too long. “Beware of false prophets” used to be just a biblical advice. It is also a Nobelist’s advice now. There is a progress wherever you look. Take a look at Johnson-Weld. You may be pleasantly surprised we an honest third choice this time. If you do not vote for Trump, you are voting for Hillary…There is NO third choice !! I’m with you Mike- Johnson/Weld is an excellent choice- and IF allowed into the debates has a chance at winning… If everyone would quit saying/believing he’s a wasted vote, I believe he could win- But don’t worry Marcus- My evil I’d be voting against would have been Trump. So, Johnson/Weld is stealing votes from BOTH sides…. At least you admit not wanting Trump. For anyone else, remember 1992 and Perot, who ran to the right of GHW Bush, and votes for him resulted in the election of Bill Clinton. Hillary Clinton is bad enough that any action that increases her chance of winning should be avoided. Her policy on global warming is bad enough to almost overshadow her policies on the economy and civil rights, let alone her placing the State Department up for bid. Regardless of what else pops out of Ms. Clinton’s e-mail closet? Amazing . .
…There is NO third choice !! There is no choice at all. The wrong person will be elected even if Trump and Clinton are miraculously killed in a plane crash. Starting with LBJ both parties policies have resulted in a growing number of folks who will never have a good job. The mantra was that the answer was education. Now we’re seeing that AI will replace knowledge workers. Even lawyers will be replaced by AI. Bill Clinton promised to stand up for the little guy. Bill Clinton lied. Hillary (I can be anything you want me to be) Clinton will do no better. Trump loves only winners. He doesn’t even know the problem exists. Krugman is saying that since models have worked before, in many fields, we know the climate models are correct. Cos models work. Shut up. Can you provide a citation for that? Your description sounds bizarre, unlike anything I’ve seen Krugman say. How is the climate supposedly changing that has you and your sycophants so concerned? It is quite hilarious that Krugman is held up here as a voice of wise reason, with the suggestion to emulate his approach, and listen to his guidance. Krugman is the Michael Mann of economics (a pseudo-science itself, with even less connection to reality than “climate science”). He is a bullying know-it-all with a huge platform. He fails regularly, and spectacularly, yet pretends he is infallible. He even calls himself the Krugtron the Invincible, and his critics the “Always-Wrong” crowd. Krugman, like Mann, relies on unsound and failed computer modeling. And on ad hominem attacks against logical critiques of his failed models and predictions. He’s different from Mann in that he is able to “nuance” his predictions–that is, his writing he is cryptic, taking both sides of most issues, so that he can later claim success, regardless of the outcome. So, why should anyone listen to anything Krugman has to say–in his own field of economics, for sure, but in a totally unrelated field, especially? He has nothing useful to add to any discussion–except hubris and disdain. His Nobel prize is worth about as much as Obama’s Peace Prize. To be fair you cannot criticise Krugman for making ad-hominem attacks when you refer to him as a ‘bullying know it all’. I always think bile is better kept in the liver rather than being spread across the internet. Well, Bob, have you ever followed Krugman? His attacks on critics and his whining about criticism is positively Mannian. Just read Krugman regularly, if you can stomach it. If not, Bing “Krugman bully” and you’ll have more than you can stomach. Voted worlds #5 thinker … right behind #4 Russel Brand. Bob, sometimes it is better to be honest than nice & fair. If everyone that ever came in contact with Krugman (or his like) would provide an honest assessment, like Kent does, then maybe Krugman would learn from the criticism … then again it may be too late for Krugman, but others certainly would be more apt to see him as he truly is. If more people would call Krugman (and people like him) on his blatant BS (like Scarborough did in Kents’ referenced citation) then world would be a better place. Krugman is a lying P.O.S. Simple honesty … call it bile if you want to. Only the leftie luvvies feel the need to pass out such awards for people who tow the PC line. Ahead of Brand is Naomi Klein… and number one was Piketty … ’nuff said. Can’t encourage scepticism … must all think correctly and here are some fine examples… I guess Dawkins didn’t attack enough religious figures last year to rate. Oh and I am atheist myself, but I don’t see the point in attacking religious people. The “no harm, no foul” approach seems reasonable IMHO. There is a very subtle and clever twist to holding Krugman to his own espoused standards. He then cannot wriggle out of such a test on some other grounds. Hoist on own petard. Kudos to Larry for having devised it. First use of this particular jujitsu move was Lewis and Curry 2014, which used ONLY official AR5 stuff to counter the CMIP5 model sensitivity and thus IPCC’s own conclusions about ECS range. I think it’s important to do more of this. Screaming “we’re right” and “conspiracy” are not going to convince people other than far-right true believers. The “correlation of forces” (as in military jargon) has been shifting against climate skeptics for years. It’ won’t take much to create an opportunity to stampede the public into support for public policy action. Time to try new approaches. So we shouldn’t point out the conspiracy? And I guess we should embrace the conspirators? This is fallacy born of ignorance, there is absolutely a globalist movement that is using CAGW to eliminate the independence of the individual. This is not a conflict between 2 powers trying to gain control that needs moderation, it is a coup to eliminate the rights of the individual and to shift power away from you and your right to live your life as you see fit to a bunch of elitist who proclaim that they know what’s best for all of us. When in fact they are just trying to rest control to assure their own position. I am not trying to control anyone, I am not trying to enforce my will on anyone, I am just resisting those that are. Like reinforcing the utterly ridiculous notion that humans can’t conspire? Yes they can, and oodles of them do every day. Gangs, cartels, Mafias, drug traffickers, human traffickers, etc, etc . . and each and every police/politician/bureaucrat bribe payer or receiver all over the world. It is silly to speak of conspiracy as even unusual on this planet . . don’t you agree, once you think objectively about it? Playing along with the (to me) ridiculous idea that conspiracy is extremely rare or impossible or whatever, is aiding and abetting conspirators, and encouraging more conspiring, it seems obvious to me . . So why do so many mass-media talking heads roll their eyes in unison at any suggestion of conspiracy?? There’s only one logical answer I can think of, Larry. How ’bout you? I repeated the point in the very first comment above. That’s not a “juijitsu” of Krugman or climate modelers. You’re clearly and unequivocally holding up Krugman as an exemplar of scientific probity and wisdom. Again, why on God’s green earth would anyone take anything that Krugman has to say about modeling seriously, much less hold him up as an exemplar and wise sage of scientific inquiry? … Again, why on God’s green earth would anyone take anything that Krugman has to say about modeling seriously, much less hold him up as an exemplar and wise sage of scientific inquiry? That is really an ad hominem. We should judge the truth of someone’s statements based on evidence. Personally, I don’t find a lot of problems with the following quote. Do you? Have you examined the evidence of “the truth” of Krugman’s statements? Krugman is consistently wrong. Krugman believes in a model that is consistently wrong. Krugman virtually worships that wrong model. Krugman’s advising “climate scientists” about how to run computer models is ludicrous–based on the evidence of Krugman’s failures. … Krugman is consistently wrong. Experts as a group are consistently wrong. In fact they are no better than a dart-throwing monkey at predicting the outcome of events. The problem with that analogy here, commie, is that Krugman is not a blind squirrel. His eyes are wide-open, yet he does not see. When the light hitting his retina reveal a pebble, this demented Krugatron squirrel convinces himself that his retina actually perceive an acorn. He then writes a column about the abundance of acorns and their delicious tastiness, and pats himself on the back for his wise nut-savvy for discovering the pebble-acorns. His demented acolytes praise the wonderful squirrel cult-master for his clear acorn-vision, and go out seeking the rock-acorns for themselves. While the cult-followers of the demented squirrel happily munch on pebbles, one reality-based observer notes that they are eating pebbles. This observation enrages the great bushy-tailed Krugatron and he unleashes his fury on the reality-based observer. A year later, when dentists throughout the forest are profiting from the tooth-reconstruction work on the damaged mouths of Krug’s followers, the all-knowing Krugatron writes another blog pointing out that he knew the acorns were pebbles all along, you bigoted haters! So, no, Krugman is not a blind squirrel. He’s a demented cult leader living in an alternate reality squirrel. Please don’t smear all Economists with the likes of Krugman. I am an economist. Oh, and I would class it as a social study, not a science, though in reality it is a crossover of both to some extent. Based on human values, desires, and decisions, it is founded on clay, but does a good job of it given that. Many analytical techniques under uncertainty came from it. Ok, sorry. Economics is a fascinating subject of study. Surely there are some useful micro-applications. But the “quantification” approach to its study is an abysmal failure. The more that models are created and run–especially in Krugman’s special field of warlockery, macroeconomics–the more they fail. The more the fail, the more the stuck pigs squeal (see Krugman’s peacockish preening, boasting and denigration of his critics). Since Krugman inserted himself into “climate science,” with all his baggage of failed models, and you lay claim to a useful application of Economic theory, maybe an analogy to climate and weather would be useful. Krugman, Keynes, and company are like Mann and the climate modelers. They claim they have a useful theoretical computer model, but their predictions are wildly and spectacularly consistently wrong. When their failures are pointed out to them, they attack their critics. On the other hand, your economic field (taking you at your word!) provides some useful guidance to some consumers. That is much like weather forecasting–which uses short-term computer models to provide 1 hour to 72 hours in-advance predictions of local weather events. These local forecasts are useful, and accurate a good portion of the time. When local weathermen fail in their predictions, they do not blame the wet picnickers for their failed forecasts. So, the local TV weatherman (and the data-gatherers and model crunchers behind his forecasts) is an honest practitioner, working to improve his accuracy, and incorporating feedback into his work–much like you likely do with your economics work. On the other hand, Mann and company, exactly as Krugman and company in Economics, fail regularly. Instead of using those failures to improve their work, Krugman/Mann attack those who point out their failures, and adjust data as necessary to fit the model. Hope that helps to clarify. Don’t want to paint with too broad a brush. Bottom line is that Krugman is an absolute nightmare of arrogant mendacity. To use Krugman as a wise counselor in how to conduct scientific inquiry (as this article appears to do) is well-nigh insane. If the entire article was intended to be sarcastic, it should be marked with a huge /sarc tag. I would only add / note that what is called Keynesian today isn’t what Keynes said. So by all means, toss rocks at neo-Keynsians… but not Keynes… he knew what would fail, and how. Keynes fails because he imagines a huge pot of money that isn’t in the economy, that government can seize and put back into the economy. This pot of money has never existed. His basic premise is flawed, which explains why countries that try to follow his policy recommendations always fail. Paul Krugman is not actually an economist. Paul Krugman is a political activist, a socialist activist, rewarded by the activist king of Sweden, who uses his knowledge of economics to advance his anti human, UN-esque, point of view. To frame who and what that twit is, you have to understand his self image. 1st he is an activist…. the rest is a means to an end. Exactly. Krugman is a tool. He is a fairweather ally, motivated by the paycheck, and forever concentrated on whatever subjective, microscopic view can’t be entirely refuted because it may not be presented with enough meat on its bones for it to constitute a real position, save an argument. He’s always squinting at something that NYT subscribers can nod at with him, because they, like him, find if they ignore the greater reality and indulge their emotions and biases, they can sound important among others like them. Ergo, tool. He is to his own intensely narrow view of “economics” pretty much what you can expect him to be to climate: Appealing to the particular political bent that pays the rent. That takes some folding and molding of reality. motivated by the paycheck? Sure, he spends his millions of dollars. Or by the ideology and the power that he receives BECAUSE of his ideology and the praise he gets from his politicians because of his writings? How much money is a cocktail party in New York or Washington worth if it is attended by the glitterati and famous? Paul, that’s a pretty good description of John Holdren as well, including the anti-human part. I’m also fond of James Taranto’s title for Krugman, “former Enron advisor”. There is no spoon, there is no debate. The facts stand by themselves, and we are most likely cooling. Krugman should be thanked for pointing out that there is utterly no evidence that man’s CO2 is causing dangerous global warming. To what are you referring? I don’t see anything like that. Paul Pfleiderer of Stanford also writes of economic models and the importance of passing them through reality filters. He calls them “Cameleon Models” when theoretical models are claimed to be relevant for policy-making while bypassing the reality filters. Good insights for the abuse of climate models. Patrick Frank’s analysis of GCMs based on error propagation as seen at Heartland seems rational to me. The arguments against it that I have seen are not convincing to me. With it as a guide we need not wait to see if the models are sometimes right because, even if they are to some extent, we can’t trust the result. Dr Frank has addressed an important issue that the IPCC has avoided taking seriously: the failure of GCM models to converge on parameters used to assess confidence in projections. Stephens et al (2012, 2015) have shown the serious consequences of the uncertainties in estimating the role of clouds. Since each GCM model propagates its error forward from year to year so that the errors accumulate, the appropriate error bars exceed the the value of the variable predicted. He concludes that uncertainty about the effects of clouds is so great that error bars for various IPCC scenarios are equally great, so great that all of the scenarios are meaningless. In my opinion, the studies by Stephens, et al. confirm this. Some critiques of Dr Frank’s methodology have been posted online. I have some of my own. However, I think the overall approach is robust enough so that his conclusions would hold if the methodology were revised. The reason is that 12% variation in cloud cover would have a substantial on albedo. A one-percentage change in albedo would change net radiative imbalance by +/-2.4 W m-2 (0.01 X 239 W m-2). And there are other effects related to clouds apart from albedo. The IPCC relies heavily on the subjective judgment of scientists for assessing confidence in climate drivers. It seems to me that Paul Krugman is correct in saying that what is needed is a more objective assessment methodology. Patrick Frank has shown one approach to objective assessment of the GCM ensemble. He has concluded that the models are too uncertain to guide economic policy. His claim should be taken seriously. Let the modelers show that their models are robust. Decay of CO2 absorption dooms these models that are based upon linear relationships. The accuracy of these models will be improved if the make CO2 a logrythmic variable, but by doing that they will destroy their basis for their war on CO2. One point that the modelers always neglect is that error bars are cumulative. It’s been too long since my college physics classes, so I won’t attempt to explain calculations that I don’t remember that well. To put it simply. If you multiply together two numbers, one with an uncertainty of 1% and a second with an uncertainty of 2%, then your result, doesn’t have an uncertainty of 1%, 2%, it is (if I remember correctly) 3%. The more factors you add to the mix, the greater and faster the uncertainty grows. When you run the same equation iteratively, as most GCMs do, the uncertainty grows with each iteration. Given the huge uncertainties in past estimates of the earth’s “temperature”, uncertainty in clouds, and so on, there is no way these models can be producing numbers that are usable. I’ve looked at the code of a couple of models. IMHO, you are correct. They are curve fittings without key variables and with lousy error tracking. Essentially, graduate thesis toys useful for getting a pat on the head degree, but not for modeling reality. More and more climate scientists are fixing the data to match the models. None of the models have worked foward or backwards. Actual emmisions depend entirely on how they define emissions and subject to revision depending on the circumstance and outcome. Climate scientists restarting the Debate? I thought it was settled science. The models are so far off that it is an opposite proof. It proves AGW wrong. The only reason this keeps going on is misguided public employees, government officials, and loyal activities, who have blind faith in AGW. AGW meets every criteria for a religion. You’ve pretty much described the state of things, with one exception. The theme of crippling Western industry and slandering corporate activities to satisfy the AGW meme fits all to well with the agenda of the Left. It is that connection that impels the movement to get rid of fossil fuels and destroy industry. Without government and media help, the global warming movement would be like a vampire in the sunlight! AGW agenda of attempting to shut down the west isn’t even debatable. The proponents of AGW are pretending to ” save the world ” when all they are, plain and simple, communists. The short term goal is to destroy the west, and the long term goal is to transform it into a wretched communist state. The US should invite the UN to leave. They take up valuable real estate, have spies and miscreants roaming around, and are basically corrupt. The models are so far off that it is an opposite proof. It proves AGW wrong. Bingo!!! We have a winner. In any real science the results of the models would signal going back to step #1. If these people worked on Wall Street as modelers, they would all be fired. Only in academia can work this bad keep you employed. Or, if they worked in an Ivy League Economics department, apropos this article, they’d be awarded the Nobel-administered-Swedish-bankers Prize, and hired to write a political column attacking those who disagree with them. Here is how you approach the issue. Hold you hand out for any graph of CO2 versus any climate variable, least squares trend line fit, and correlation coefficient over 0.7, that is, not noise, sufficient for public policy. Time versus climate variables is false correlation of independent variables. You must graph dependent variables. No more time in the x-axis, start using carbon dioxide concentration. So far, CO2 versus global mean temperature data sets shows correlation around 0.34, which is called random noise. Start there. Then worry about it. Kaspar – A good start. Here is a related problem: if global temps are rising, any monotonic, rising phenomenon can be substituted for rising CO2, and the logic works. CO2 is not varying with anything; it is rising monotonically. In the modern era, no one has yet recorded CO2 decreasing. That would let us check whether temps also had a similar decrease. This is fundamental to analyzing causality by examining supposedly related phenomena when they cannot be experimentally manipulated. The archeohistorical accounts seem to say that CO2 and planetary temp do not covary, or that temp changes precede CO2 changes. Granger and Engle won a Nobel for work on co-integration, deveoped for econometrics. Time series are notoriously vulnerable to spurious correlation. Which is why first differences are taken for cumulative variables, such as CO2 intensity. It isn’t even that high, that is the result of “adjusted” temperature data. They can’t even adjust the data enough to make this model work. While I understand the sentiment about retesting old models on actual emissions to look at the accuracy of predictions, it is both impractical and unnecessary. Impractical because the warmunists who maintain them and ‘own’ the necessary supercomputer resources would not allow it. They have no incentives to be proven wrong, which they know they would be based on things like the missing tropical troposphere hot spot. Unnecessary, because the CMIP3 and CMIP5 models ran multiple scenario simulations that bracket what actually happened. For CMIP3 it is scenarios A1b and A2. For CMIP5 it is RCP4.5 and RCP6. If actual (which has to be defined, lets stipulate low to mid troposphere as measured by the average of 4 radiosonde and three Satellite measurements, because the surface stuff is polluted by UHI and microsite issues, and subsequently fiddled) is statistically significantly lower than the lower bounded model run archived, then that model is falsified. Period. The only remaining argument is the period of time before this comes definitively true. BAMS 2009 argued 15 years. Santer et. al. argued in 2011 17 years. An attempt last year to push this to 18 years was mathematically destroyed by Nic Lewis at Climate Audit. So, we just wait and see what happens in 2017. Larry’s desired experiment will have been run without having to do anything. And this is being charitable, because part of this time frame for CMIP5 includes tuned hindcasting, and the models still don’t get it right. The only CMIP5 model that might ‘pass’ this test is Russian INMCM4, which has high ocean thermal inertia (water planet), low water vapor feedback, and low sensitivity–although still higher at (iirc) 2.2 than recent observational 1.5-1.8. The multivariable modeling techniques used by the Climate Alarmists have their roots in the field of economics. The original climate models were simply edited financial models. Every economist out there that has ever take econometrics knows this CO2 driven AGW model is pure garbage. Every serious statistician knows this CO2 driven AGW model is pure garbage. Every mathematician knows this CO2 driven AGW model is pure garbage. If you simply blindly test the data there is only one conclusion. Only once you identify the data as applying to AGW does the conclusion reverse itself. It is pure garbage. No double blind examination of the data would ever reach any other conclusion. How can anybody think that the methods of science as described in this article could make the case for alarmism? These methods have been tried for decades and the data falls firmly and consistently on the side of skepticism. Ad hominem, suing those who express skepticism publicly, trying to cut the tiny incomes of the actual scientists (skeptics) — those are the only methods the alarmists have. That is why they resort to these means. The public is so profoundly science-illiterate that alarmists have been able to talk about “ocean acidification” to describe an alkaline pH that has moved .01 toward neutral–if the measurements are accurate. This is why skeptics get almost nowhere on the basis of the facts. Only emotions count in a debate like this. We can get the screamers emotions on our side by studying regenerative agriculture. This is bright, positive, and truthful. By working with the greenies on this, we can transform them from devastatingly harmful, to making a GOOD difference. It will then be the easiest thing in the world to teach them a little science that backs up what they are doing. Judith Schwartz has just written her second book about water. Her first one was Cows Save the Planet. Get it. An adult answer to alarmists that are the equivalent of a three year old sreaming “you don’t love me” to his mother in the grocery store because she won’t fill the grocery cart full of crap is unlikely to have an impact. Good article though. Non alarmists( ie grownups) have been suggesting this for years. 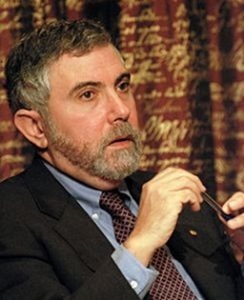 “Krugman, armed with his Keynesian model, came into the Great Recession thinking that (a) nominal interest rates can’t go below 0 percent, (b) total government spending reductions in the United States amid a weak recovery would lead to a double dip, and (c) persistently high unemployment would go hand in hand with accelerating price deflation. Because of these macroeconomic views, Krugman recommended aggressive federal deficit spending. Lets not forget Krugman’s advising the Japanese on how to fix their economy…print more money…and now the BOJ owns pretty well every bond and stock in the country and the economy is worse off. His excuse: they didn’t print enough. That they paid him for his advice is bad enough..but following it is worse. The unbearable lightness of being Krugtron the Invincible is filled with being wrong, being nasty, being nastily wrong, and being unsufferable. Krugman’s entire schtick is based on a klunky and consistently wrong economic MODEL that he worships and constantly babbles about. When he’s not making badly wrong economic predictions, Krugman babbles about his model and his superiority in pretty much all facets of life. The irony of Krugman directing another field of endeavor in how to carry out research, and how to use models is too rich. Wasn’t it Krugman who waxed poetic in regards to the ability of the Chinese government to go ahead and do the “right thing” without having to worry about public opinion. Don’t forget that under GW Bush Krugman predicted that America would become like Argentina. He is not only wrong, he is cynically and consistently wrong. For a deep look into the heart of the shrill harpy of PC-Progressivism, his demons, his enablers, his shallowness, and his utter establishmentism, see this in-depth personality profile. It all depends on the results of November 8th 2016. If Mrs. Clinton wins, this mess will continue for decades. Federal Government funding causes global warming! Federal Government funding causes Mann-made global warming! That is pure genius. We need a chart of AGW funding and temperatures. That will have an R^2 of 100, and a Correlation of +1.00. There is no way the mess we call Western economics carries on like this for decades. We have a massive debt depression on the horizon. The only cure for that I am aware of is high inflation. Whether or not it will be possible to generate that before we fall into a deflationary spiral is very questionable but whichever way that goes, it will be very painful. I’ll disregard that snide remark and point out that skeptics have been arguing the facts and demanding predictions for nearly three decades. It’s the alarmist side that has been unapologetically vicious in their unending assaults. It’s fact. Just look at the comments at WUWT for confirming evidence of my statement. Lots and lots of comments about the conspiracy of climate scientists to distort the global temperature record. It appears to be a core belief among commenters here. You are wrong. I have been reading this blog for years, and the vast majority of informed skeptics here don’t believe in a massive AGW conspiracy. They know that AGW alarmists are much better funded, and suspect many in that camp are motivated by all that money sloshing around (most of it provided by the tax payer), but that’s not a conspiracy. That’s just blind herd mentality. It is the Attorneys General of states led by pro-AGW fanatics that are doing the witch hunting. Naomi Klein has written a book, and made a pretty good living selling the ideas in that book, about how there is a grand conspiracy by “big energy” to destroy the Earth. Lewandowsky and his gang…well do I need to go into more on that most unpleasant academic? While some skeptics are certainly “muttering”, it is fanatic believers who are shouting… and getting their shouts echoed in the public square. If a single skeptic says something stupid, that’s proof that all skeptics are conspiracy mongers. For some reason leftists believe that they have to create false equivalencies whenever they criticize another leftist. Yes, it did. But it was based on clear physical reasoning, which was accepted by those who could follow it. To them, the success was not surprising. Climate models predict climate (response to forcings), not weather. To get a “surprising successful prediction”, you need to wait until the climate has in fact changed. It’s no use hassling about short term effects, which aren’t the prediction. Climate models predicted warming, and we have had warming. So they are on track. To be sure, you’ll need to follow them longer to get empirical assurance. But in the interim, as with general relativity in its early days, the underlying physical reasoning makes them the best estimate that is what you should use when needed. As to re-running old models, that is no different to backcasting that is currently done, and was done with the old models when they were new. “Climate models predicted warming, and we have had warming. So they are on track …”. The models are not even close to reality. Krugman says to make a comparison between the climate models and reality. Well, there it is. Reality is the little blue line at the bottom. The climate models are all those lines shooting up at a 45 degree angle. Not even close. There you go, Paul. Problem solved. “Reality” is a cherry-picked region – tropical mid-troposphere. How about a global comparison? “How about a global comparison? …”. According to the models the mid-troposphere over the tropics is where enhanced greenhouse warming should be most apparent, 2-3 times that at the surface, but I think you already knew that. You mean the surface temperature chart? The surface temperature chart looks very similar to the satellite temperature chart, so if you superimpose the surface temperature trend over the satellite trend, the chart is going to look the same. So I don’t see how the surface temperature chart makes the models look any better. The “underlying physical reasoning” aka “The Science” hasn’t got anything right yet, that is, nothing having to do uniquely with CO2 increases, which themselves have seen significant periods of radical Temp divergences twice since 1950. So instead of, “It’s just like Gravity”, now “It’s just like general relativity.” Which means you have no case whatsoever. Climate models do not produce unique solutions to the problem of the climate energy state. There is zero reason to suppose that the recent warming and model outputs are any more than tendentiously coincidental. Nick Stokes wrote: To get a “surprising successful prediction”, you need to wait until the climate has in fact changed. From where I sit, we haven’t even successfully defined what it means to say that “the climate has changed.” Ergo, any measurement or analysis of whether or not it has happened is impossible. But In that vacuum, lots of people have sloppily and even corruptly claimed such a measurement. “Nick Stokes wrote: To get a “surprising successful prediction”, you need to wait until the climate has in fact changed. The paper by Belda et Al (2014) shows the climate regions of the world (except Antarctica) for two periods, 1901-1931 and 1975-2005. Between the two periods separated by 75 years. The Belda paper does not discuss error bars. However, the CRU (UK) has revised the climate data to remove wet bias, an adjustment that would increase R2, indicating even less change than these maps show. So yes, the Earth has warmed a little and most people worldwide are better off than their parents and grandparents. The people benefiting the most are those on the margins of steppe to desert and those on the margins between ice and tundra, but they are relatively few in number. You said, “Climate models predicted warming, and we have had warming. So they are on track.” Or maybe it is a spurious correlation because warming has been occurring for 10 to 15 thousand years. There is nothing surprising about warming based on past events. You suggest, “…you’ll need to follow them longer to get empirical assurance.” The point is, the models are running warm and the longer we observe, the less convincing the predictions are, based on empirical data. Logically, only one model can be the best as judged by the agreement with empirical data. Averaging the best with all the others just degrades the predictions. What should be done is to look at that one “best” model (I think it is a Russian model) and see how it differs from the others. That is the greatest value of models, providing insight on what is happening and how it is happening. Yet, climate scientists give equal weight to all of them, stir them in the pot, and say “See, it is going to get warmer.” A bookie probably would have come to a similar conclusion based on past history. How can models give us confidence that the correlation (as poor as it is) with predictions and reality isn’t spurious? Systematically wrong, as usual for you. Almost every sentence. I assume you are (again) trolling us. First, directional predictions are not enough. Magnitudes matter. Precision and all that. Second, the world has been warming for 2 centuries, with anthropogenic effects dominant only since after WWII. So the warming by itself does not show models are correct or that there is AGW. The models used in the first three Assessment Reports give us multi-decade predictions, if re-run with actual emissions. While not definitive (what is? ), these results will tell us more than we know today. The relevant question in this post is about models as the basis for large-scale public policy measures. “Best estimate” is not enough. We need confidence in the reliability of the estimate. False. Running the data with data available when the model was created raises the questions about the role of tuning — which is (why outside of climate science) back-testing is not considered adequate unless additional measures are taken (e.g., running vs. out of sample data). Yes. That would be a change. And for utility in verification, you need to compare against the uncertainty of measurement of the result. It takes time to get confidence in the measurement of the change and its prediction. Yes. But the first question is, is the GCM-based prediction better than what you would have assumed in its absence – probably zero change. It’s all you’ll ever have. And it is better than a worse estimate. There are decisions that just have to be made. Assuming zero change is choosing a basis for the decision, just as is using the best estimate. People mix up the role of tuning with curve fitting, as if having a few extra years data will alter the model and fit those years better. Tuning is done to characterise a few parameters that are otherwise difficult to pin down. The 2012 Mauritsen paper was much discussed, as it lay out in detail what tuning steps they used. The use they made of surface temperature was to shift the 1850-1880 global average temperature to the observed average of 13.7°C (para 12). Switching to an earlier model would not change that. They also, at an intermediate stage used a SST average 1976-2005 for matching. But again, that isn’t trying to match detail, just a single number. Any similar period would have sufficed. Tuning is typically done on a run of quite a short period. Is there a C in AGW? For once and for all, because I have asked you this a hundred times, do you believe that there is Catastrophic warming coming from AGW? That is a sceptic framing. For my part, I just try to work out what is going to happen. I mostly leave it to others to decide how bad they think that will be. I do think AGW will cause problems for a lot of people. Not correct. Parameter tuning is done so as to cause the projected trend to match an observed trend. Tuning does not adjust a parameter to a physically correct value. Tuning adjusts a parameter to maximize statistical merit. Tuning does not make a projection physically more correct, nor does it reduce the uncertainty of a projection. Projections made using tuned parameters are not unique, nor even tightly bounded, solutions to the climate energy state. Indeed, the true physical bounds to a climate projection are not known but are likely to be extremely wide; and to grow with projection length. People don’t “mix up the role of tuning with curve fitting.” Model tuning is curve fitting. It’s pretty clear from this and other comments that Nick does not know how physical meaning is assigned in science. Consensus climatology has substituted statistical merit for physical meaning, making it a playground for Nick, but rendering the entire field into a pseudo-science. Taking medication is always based on the best estimate of safety and efficacy. You never have perfect knowledge. Drugs are permitted and used when the likely benefit (relative to alternatives) exceeds the estimated risks. And knowledge of chemical mode of action and subsequent excretion of breakdown is part of that estimation. Based on real World empirical trials and the principles of real Science, the “best estimate” of the alleged CO2-Climate Change Disease is that it does not exist. Likewise, the best estimate for The Treatment Of Nothing, involving trying to decrease the atmospheric concentration of CO2, or actually doing it, is that it should ‘very likely’ to ‘certainly’ get you a clear passage into Hell. Why don’t people want nicer weather and more abundant crops, again? So all the warmers need to do to be taken seriously and advance public policy in their preferred direction is to make falsifiable predictions correctly? That would certainly be a major shift in strategy from making predictions beyond any of our lifespans, and being 100% wrong about their rare near term exceptions. Hmmm. It depends on where and how you measure warming. For most of the US there was no warming of maximum temperatures that exceeded the 1930s and the US has the best climate data for the past century. The US may represent only a small subset of the globe, but data for most of the rest of the world is guess work due to the lack of real data. For the last decade the Arctic Ocean has cooled due to ventilating heat that warmed air temperatures. Thus warming air temperatures represent cooling not predcted heat accumulation. Most of Antarctica has not warmed and the Antarctic peninsula that once warmed dramatically and was toted as the canary in te coal mine is now cooling. I think Nick has some blinders on! There are three different types of comparisons that you can make between calculations and comparisons to show that your models are correct. (1) Open comparisons where the people running the computers know the results of the experiment, and are just trying to match it. This is what would be done under Krugman’s proposal. (2) Blind comparisons, where the modeler does not know the actual experimental results, but does know a lot about how the system he is trying to model works, so that he can tune the calculation for special situations where he understands how the system reacts. (3) Double blind comparisons, where the modeler does not know either the exact experimental results, OR how the physical system has reacted in other “experiments”, so that there is no way the modeler can cheat. He has to hope that he has the physics right, and he has to hope that all the little things that he thinks are irrelevant are actually irrelevant, and not major phenomena that he has not/cannot model. In some engineering disciplines, the double blind comparisons are the only acceptable proof of a modelers abilities. This would be very hard for climate calcs, where there is a lot of data about how the system works, so the blind comparisons are probably the best we can hope for. I think that when you are proposing to change the economy of an entire planet, it would be prudent (see the precautionary principle) for the people advocating for change to at least TRY to doa blind comparison, and it seems like some of them have actually stuck their necks out and made some predictions. When the predicted time comes, and they don’t meet the test, then it will be time to (metaphorically) chop off their heads. Valentina Zharkova and her colleagues have done just that. Interestingly, some science blogs dismissed this work in words that suggest to me that the writers, including a physicist writing for Forbes, are unaware of the vast literature on the solar physics as it influences the climates of the planets. (There is a lot more to solar physics than sunspots and TSI (total solar irradiance). Rather than Popper and Kuhn, I say Pauli and von Neumann had the better description for the current state of climate science. Climate models with a range of possible outcomes so wide that they are virtually unfalsifiable. Models with so many free parameters that they can predict anything the modelers wish. The model predicts the elephant will fly! Thomas Kuhn’s book describes the current state of climate science quite well, as the usual no-quarter-given defense of a paradigm. Lots of similar examples in history. For details see Thomas Kuhn tells us what we need to know about climate science..
As for Popper, he’s ignored or despised by many climate scientists. Which is in itself significant. Have a look at Patrick Frank’s lecture and paper. He shows that most of the variables in the models have little effect on the results. He is able to replicate the models using a one-line model. Multi-million dollar grants are not needed. Dr Strangelove, you could replicate the CGM outputs used by the IPCC in a day on your laptop. The GCMs are complex but the output is just a set of numbers that when you plot forms a curve. The curve can be replicated with a simple linear or quadratic equation. It’s like writing and solving all the physical equations of all the moving parts of a car. The output can be just a time-distance chart of the moving car. It looks simple once you have the answer. But what’s the question? You have to get out more. Being consistently and spectacurally wrong over and over again gets one on the list of “top thinkers”. But then again Obama got a Nobel for being, not Bush. As if the Failed Krugman and his Failed New York Times, will Vanquish and smite All in their path to Oblivion. The smell of Oblivion, … Victory. This same pearl clutching. The models have already been tested and failed, but you’re convinced that this time, THIS TIME!, we will all suddenly relearn Popper and the scientific method and the scales will fall from our eyes. This whole thing ceased to be about the science decades ago. It’s merely the next battleground between the state and the individual. You will repent your sins and you will bow to the will of the state. The models predict surface temperatures very well actually. Problem is no one on this blog knows the difference between satellite measurements and surface temperatures. So the bitter public policy debate rattles on, each side hoping for a brute-force political resolution that crushes the large fraction of the public that disagree with them. Perhaps that will happen, and perhaps that will produce a useful outcome. But we can do better. Brute force political resolution is unavoidable – that whole thing is unaffordable. Just a couple of thoughts. First, I believe Einstein’s bending of light proof the first time was wrong. If I remember correctly it had to do with a solar eclipse in Siberia during WWI. It turned out Einstein assumed the Sun was a perfect sphere, which it isn’t. Second, in relation to the drugs comparison: I read several years ago that if every drug that didn’t perform better than the placebo in the double-blind studies was removed from the market, we would basically have alcohol and aspirin. I can’t imagine where you read such a thing. I suggest you tell your doctor. He’ll enjoy a moment of laughter. Or wait until a loved one is sick and then refuse drug treatment. Tell us how that works out for you. I have had malaria twice from three species, typhoid, paratyphoid, respiratory failure from a Rickettsia infection, shingles outbreak twice, and MRSA following treatment for minor cut. All of these could either have killed me or made life miserable, but all were successfully treated by modern drugs. And so here I am, well past three-score and ten years because for most scientific claims, I accept the consensus view. In this I agree with Michael Shermer who explains his position in his great series of lectures. The reason I do not accept the consensus view of climatologists is the same as the reason I did not accept the consensus view for fixed continents in the years before plate tectonics became the consensus view: the evidence does not support the theory. As for death from prescription drugs. I have seen that major causes of death are 1) not following directions for drugs that have been appropriately prescribed or 2) following directions for drugs not appropriately prescribed. There are other problems with prescription drugs as well, but avoiding all prescription drugs is not the scientific way to approach the issues. Each recommendation to take a prescription drug has to be considered on its own merits based on the risks of harm compared with the value of the benefits. Or you can just rely of the authority of the physician without question. I don’t because I’m a skeptic, except for respiratory failure when I was in no condition to ask questions. Without apparently knowing it, Krugman identified [PRECISELY] why CAGW skeptics are extremely skeptical of the disconfirmed CAGW hypothesis…. CAGW’s global warming model predictions are already laughably devoid of reality, with empirical global temp anomaly data already 2 standard deviations lower than predictions for 20 years! Under the rules of the scientific method, such huge margins of disparity and duration are already statistically significant to disconfirm the CAGW hypothesis…. Congress realizes this disparity, too, and has already issued a FOIA request to NOAA for all internal e-mail correspondence regarding the “Pause-Busting” KARL2015 “adjustments” made to GISTEMP data. NOAA has told Congress to effectively go to hell; as they have absolutely NO intent of complying with this congressional FOIA request, and are now technically in Contempt of Congress..
Jeez…. I wonder what NOAA and NASA are trying to hide??? We’re getting tantalizing close to CAGW imploding. Yes they are, despite what you have heard. But the corrupting effect of big money has proven to be too powerful for the existing methodological safeguards. Lots of discussion now about how to strengthen them (e.g., requiring registration of studies before starting, so negative results aren’t put down the memory hole). Climate science could learn a lot from medical testing (drugs and devices). I suspect that climate models could be made to be a lot more accurate than they are, but political powers need highly inflated results for indoctrination purposes and to push legislation. For example, on pages 11-12 of this government report they tell the citizens of Croydon that there is a chance of a 7°C rise in temperatures before the end of this century. And where do get such absurd figures? Someone models it, and then they publish the outputs as though they were facts instead of made up data. Here’s a classically condescending pull quote. “It is important that the public are not misinformed about the degree of climate change and its potential impacts. Seasonal fluctuations in the climate’s natural behavioural patterns can mask the long-term climate changes. For example the winter of 2009/2010 was characterised by temperatures below average, and extensive snow and ice cover across the UK, which would not appear to the general public to be characteristic of a warming climate. For physicists and engineers this would be a red flag in any other field except climate. The processes affecting climate can exhibit considerable natural variability. Even in the absence of external forcing, periodic and chaotic variations on a vast range of spatial and temporal scales are observed. Much of this variability can be represented by simple (e.g., unimodal or power law) distributions, but many components of the climate system also exhibit multiple states. Movement between states can occur as a result of natural variability, or in response to external forcing. The relationship between variability, forcing and response reveals the complexity of the dynamics of the climate system: the relationship between forcing and response for some parts of the system seems reasonably linear; in other cases this relationship is much more complex, characterised by hysteresis (the dependence on past states) and a non-additive combination of feedbacks. This is complete nonsense. When a pharma major e.g. GSK or Pfizer, carry out clinical trials, they pay for them. They design the protocols, they either do the experiments themselves or hire third-party contractors to do it on their behalf, they analyse the data and they present the data they choose to present to regulatory authorities when seeking marketing approval. Everyone is affiliated to the pharma major in the carrying out the clinical trial experiments. If things were independent, then the FDA or equivalents overseas would be supplied by GSK with the funding for the trial, the trial would be designed by experts commissioned by the FDA, not by GSK, the data would be analysed by third parties, again commissioned by the FDA, not GSK and the analysis would be scrutinised by the FDA, not by GSK. That’s what independent evaluation of drugs would entail. Everyone knows that it doesn’t. It’s not saying the reality is appalling, but it is saying that it is skewed in favour of pharmaceutical company profits rather than dispassionate clinical practice. I had an economics professor tell the class the job of who specializes in economics is to predict the future then explain why the prediction failed.. Sore of like paying a baseball player big bucks with a 1.5 batting average. Gets on base 3 times for every 2 times at bat. That’s pretty good. Perhaps you meant a 0.15 batting average. Until climate models include solar variations, lunar modulations, ENSO events, PDO/AMO cycles and volcanic eruptions/earthquakes in their scenario planning, they are pointless wastes of money. What deadlock in the “climate policy debate” is there? I see none. What I do see is that the government has its mind made up and regardless of facts and the opinions of others is blasting full speed ahead with its climate policies of, for instance, heavily subsidised renewables and the EPA clean air plan. There can be no “debate” when one side does not listen, and has never listened, to anything the other side has said. I guess neither Larry nor Paul understand that the models have been run. And rerun. And rerun with actual emissions, and rerun with adjusted temps and rerun with adjusted models . . . They have failed. The alarm is completely unjustified. The only thing that is ‘worse that we thought’ is the embarrassment that will certainly attain once the larger scientific community sees what these people have been foisting upon the world for at least the last 10 years. So they go with consensus. They recruit stars from other fields. This is getting more and more entertaining. Unfortunately, this may leave us ‘in the lurch’ based on what the sun appears to be up to. We may be heading in the other direction, and with a dirth of new coal plants in the western hemisphere, things could get a bit dicey and that doesn’t even consider the agricultural impact we might want to prepare for. Apparently those scenarios aren’t even on these guy’s radar screen. Krugman shows that he still does not understand the scientific method. Several times, we have been led astray by the desire to “corroborate” instead of conscientiously seek to refute conjectures/hypotheses/theories. Repeatedly, his neo-Keynesianism has been refuted, and he’s focused on fabricating Freudian-like excuses and rationalizations rather than abandon the failed hypotheses. When I am wrong, I am wrong. I must reject the failed theory and ask questions and try to propose another hypothesis, then turn it loose to be tested and critiqued. Let’s take a peek at some of Krugman’s other thoughts that have been recently dissected for some perspective…..
What is bizarre and perhaps unique to “climate science” is that the claim that some spectral effect can “trap” energy on the side away from the source , 400K over a distance of a few hundred km in the case of Venus , has neither an enabling equation nor experimental demonstration to support it . Injecting Paul Krugman into a science debate about global warming is a fundamental mistake. That is equivalent to throwing mud in the Olympic pool after it already has a green problem from a shortage of pool chemicals. That guy is a severely politicized economist in his own inexact science. You don’t need him to be a middle man for hard science methodology messaging when you can go there directly. His only purpose is to translate his brand of perpetual monetary stimulus into climate policy debate. Therefore he becomes a tool for carbon tax revenue to stimulate and redistribute again and under the new label of climate policy. Krugman fits the bill precisely because he is not a “hard scientist”. Climate science is desperately in need of a few physicists to re-examine the trampeled ground (and try not to laugh) to arrive at conclusions and direction for future research, free of political influence or filtering. The present state of things is corrosive to the good name of science. Long past time the politicians butted out! This “surprisingness” standard I have read about before, I can’t think of any good examples in which it has help convert adherents on one theory to another. In fact, the idea that a natural level of unemployment is bolstered by the ability of the Phillips curve to explain some observation seems pretty suspect when the 1970s appears to have set back the suitability of the Phillips curve itself as a tool. The idea that a theory gains credibility by delivering correct, and previously unexpected results, seems fraught with problems. For instance, it suggests a standard of proof without reference to alternative explanations that provide equally surprising or even more surprising observations. How does one apply a weight to such evidence? What weight does one apply to a big “boost”? The observation of the angular deflection of starlight was not unexpected, but was rather a consequence of theory that people designed experiments to test. Otherwise, what explanation is there for astronomers being in all those godforsaken places at the very moment of an eclipse? What idiot even cares what ENRON ADVISOR Krugman spews? The essence of this essay is that the predictive track record of the advocates in the global warming (CAGW) debate should decide who is correct and who is wrong. I agree with this premise. The global warming alarmists have been consistently wrong, since none of their scary predictions have materialized. The warmists have perfect negative credibility to date. Furthermore, that is ample evidence of unethical conduct by the warmists in the Climategate emails, the Mann hockey stick fiasco, the temperature data revisions, etc. The climate skeptics have a much better predictive track record – below is our example from 2002. Our predictions were certainly “surprising” for that time and certainly “high-risk” – our co-author Dr. Sallie Baliunas was forced out of Harvard, allegedly by the current US President’s Chief Scientific Advisor and others – a shameful act and a great loss to the scientific community. Regards to all, Allan MacRae, P.Eng. It is a professional and ethical obligation to speak out against such destructive nonsense. Cheap abundant reliable energy is the lifeblood of society. When misinformed politicians fool with energy systems, innocent people suffer and die. Here is my recent paper, which is as controversial today as our aforementioned debate with the Pembina Institute was when it was published by the Association of Professional Engineers and Geoscientists of Alberta in 2002. I am confident that my recent paper is correct, with the possible exception of point 6 below – our prediction of imminent global cooling. I originally published our global cooling prediction in a Calgary Herald article in 2002, and I think it is still highly probable, given the current very low level of solar activity. I hope to be wrong about global cooling, however, because cold weather kills many more people that warm weather, even in warm climates – also, I’m getting old and hate the cold. All I can say, Allan, is that I’m extremely envious of the Riches bestowed upon you by Big Oil. My check is not so much as even “in the Mail”! But sadly again, in 2004 I wrote a very Skeptical Letter to the Editor of our tiny populated but very large geographical County’s Newspaper, which they published a few months later as the only Letter for that edition, because it took up ~1 1/4 pages out of about 12 total pages in that edition. Alas, here in Redneck Cowboy Country I’ve received from Big Oil not even a can of Neatsfoot Oil! For the record, I have never gained a penny for any of my writing or activities as a climate skeptic. We did get a small fee for one article in the Globe and Mail , but we gave it away. It has probably cost me income. It would certainly be easier to go along with global warming alarmist falsehoods and get a job with a government agency or one of the warmist groups. The subject has never been discussed with any of my clients. Instead of fighting for what is right, most energy companies just try to go along and avoid controversy. This cowardice was a huge disservice to their shareholders and society. I do this because it is a professional obligation to combat dangerous polices that cause significant harm to society. Regards, Allan MacRae, P. Eng. At this point it would not only be “surprising” for CO2-Climate Change to deliver just one correct Prediction based on “The Science” of increasing CO2 concentrations, it would also ruin its Perfect Record of Failure! Unhinged pseudo-intellectual snobs aka “The Experts of Academia, Journalism, and The Totalitarian Utopia” would probably panic and have to move their Cult another 20,000 miles into the cold ether to try to escape the Reality dogging them ever since their “Unjust” emergence from the warm 98.6 deg. womb. And after all, who amongst them really wants to live or rule in North Korea, the Dead United Soviet Socialist Republic, Venezuela, or the Stone Age with the spectre of something like the heat of the Nuremberg Trials always at their cloven hoofs? Their only other option would be to repair to the Underworld from whence they ultimately came. But it was also certainly “too damn hot” for “The Boys” down there!